INDIANA -- A three-day-old calf in Indiana didn't wait long before it got itself into a whole mess of trouble. 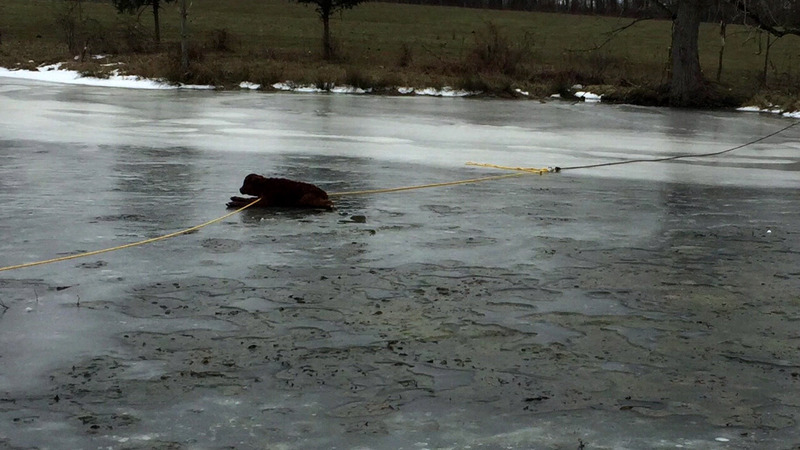 The baby slipped through a fence at its owner's ranch and found out that it couldn't walk on the ice of a nearby pond. Its owner tried using a rope to reel him in, but it was too short. A Bartholomew County sheriff's captain soon arrived with a longer rope, and the pair pulled the calf to safety. The calf suffered from hypothermia and had to be quickly warmed up. When the baby was fine, the calf's mother became so anxious to see her baby that she jumped the fence to get closer.